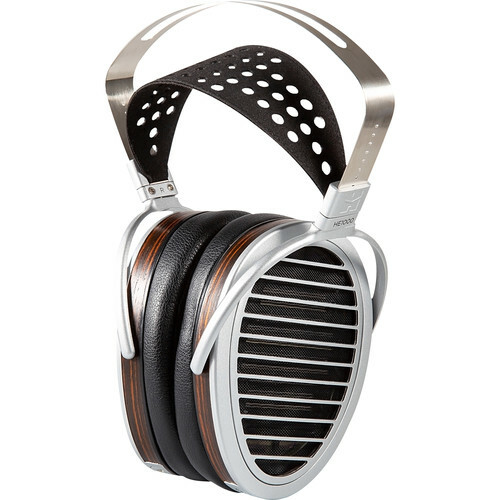 Building upon the success of the HE1000, the HIFIMAN HE1000se Planar Magnetic Open-Back Headphones feature nanometer-thin diaphragms, acoustically invisible stealth magnets, thick asymmetrical earpads, and two sets of high-quality cables to achieve reference-quality sound for audiophiles and audio enthusiasts at home, in the studio, or with portable devices. With the planar magnetic drivers, the headphones offer a frequency response of 8 Hz to 65 kHz with an impedance of 35 Ohms. The comfortable headband is designed to accommodate a wide range of head sizes, while the asymmetrical ear cups follow the natural shape of the human ear for a proper seal that's comfortable for long listening sessions. The outer enclosure is CNC milled and hand-polished for a striking appearance. The headphones ship with a standard 3.5mm cable and an updated 4.4mm balanced cable, as well as a 3.5mm to 1/4" adapter.